“Dangling awards in front of children are at best ineffective, and at worst counterproductive.” – Alfie Kohn. 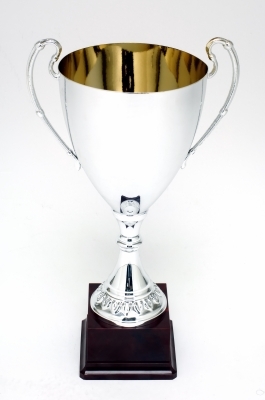 Have you considered the merits of your school’s year end award ceremony? The realization that I needed to think about trying to change the culture of my school, with respect to awards, hit me square in the face during one of our assemblies. One morning, in the middle of the school year, the principal was making her way through the staff asking them to announce their ‘Fintastic’ winners of the week. Fintastics are tickets given to students who are caught doing good deeds around the school, and are part of our school’s PBS Positive Behaviour Support System. The lucky student’s name was called out, and that student headed to the front of the assembly to be recognized, by the entire school, for being ‘Fintastic.’ Sadly, not a single explanation was given as to why we were recognizing each student, except for the fact that at some point in the last week they were caught doing something ‘Fintastic’. This educational epiphany forced me into thinking differently about student motivation, which in turn led me to think about awards and student achievement at my school. Research and numerous studies conducted by social psychologists show that the act of catching someone doing something positive and rewarding them for it in the shape of a token, gift, prize, or ‘Finatatsic’, can actually be detrimental to the type of behavior you are trying to recognise. Thanks to Daniel Pink, Sir Ken Robinson, @chriswejr, Alfie Kohn, and @gcouros I have been able to develop my own educational voice in this area, which led to some conversations in my school about changing how we recognize students, starting with end of the year awards. It’s this experience that I want to share today. In my school, at the end of the year, it is the culture to award a myriad of certificates, medals, and trophies to grade 4, 5, and 6 students in areas such as Athletics, Service, Citizenship, Abundant Asset, Proficiency, Academic Excellence, A and B Honours. I have come to realize that there are more beneficial ways to recognize student achievement. Ways that show appreciation for all students instead of a selected few. Ways that promote community building and avoid focusing directly on the individual academic achievement. During our end of year awards ceremonies I have noticed the same student’s names appear beside each award, year after year. All students contribute in some way to developing and maintaining a strong and inclusive school community, and as educators, we should be able to recognize each and every student for their individual contribution to the success of the year. In essence, award ceremonies, like the ceremonies that happen in my school and many other schools around the world, say that we only care about high achievers. In a class of 30 children when four are recognized for achieving high academic success, how do the other 26 children feel? Probably like their year was a waste of time. There exists an extensive amount of research which shows that extrinsic rewards, such as stickers, trophies, medals, and certificates can be damaging to students’ intrinsic desire to learn for learning’s sake. It has been proven time and time again in countless studies over the last half-century that when students are rewarded for achieving certain goals, they perform less efficiently than those who are not rewarded. The rewarded, tend to think less creatively, have a ‘reach the goal at any cost’ mentality, are motivated to work individually instead of collaboratively, and are often so focused on the prize they become closed off to alternative methods of reaching the goal. (Kohn, 1999) In a time when we are trying to produce collaborative and creative workers for the work force, it seems counterproductive to continue to offer rewards in ways we currently do. Towards the end of the school year I sat down with my principal and explained how uncomfortable I felt about only recognizing a select few students at the year end award ceremony. I went on to explain that it felt disrespectful towards the rest of my students. Each and every one of my students had made a positive contribution to the classroom community, and I felt the need to recognize them all, individually. She agreed that the current method of celebrating selective students at the end of the year probably wasn’t the best. We discussed increasing the number of awards, expectations of parents, expectations of students, and the effort required to change the school culture. In the end I agreed to participate in the regular year end awards ceremony with some minor alterations, but then recognise my students, after the awards ceremony, in a more respectful and holistic way. I felt confident, after our discussions, that together we could start to slowly change the culture of award ceremonies. After the award ceremony, I invited all of my student’s parents to attend one last class circle, where I would recognize all my students, individually, for their contribution to the classroom community. Before I started the circle, I explained to everyone present that this was an appreciation circle; a chance for me to reiterate how much I appreciated each student’s contribution this year. When giving feedback, I tried to give specific examples to make the feedback more meaningful. After I had finished with each student I gave them a card which repeated, in writing, exactly what I’d said orally. The feedback I received from the parents that attended was overwhelmingly positive. Even those parents whose children had, earlier in the day, been draped in medals and presented with numerous certificates, understood the value in the process. More importantly, every student received a piece of oral and written feedback thanking them specifically for their contribution. My goal for this year is to continue to have meaningful and productive conversations with admin, PAC, parents, and students around more effective ways to celebrate student achievements, particularly at the end of the year. As I did last year, I will host a final year-end circle in my classroom and invite all parents to attend. In the future, it is my hope that the culture of the school begins to recognize all students for their individual achievements throughout the year, and we no longer use the last official assembly of the school year to recognize a selected few. I would welcome the opportunity to continue learning about how others recognise and celebrate student success, so please feel free to interact. TED Talks for Kids in B.C. As an elementary educator who encourages student involvement in many aspects of the education system, not just in the classroom, I am incredibly excited about the independent TED event coming to Vancouver in September of this year. TEDxKids BC is scheduled for Saturday September 17th, 2011 in Vancouver and will showcase student achievement and celebrate empowerment of students in our education system. In a similar fashion to the larger and more prestigious TED Talks, TEDxKids BC showcases ordinary students and allows them a platform to share their experiences and inspire others to follow their dreams. Perhaps a kid who has helped others without thinking of him or herself — someone who just jumped in to lend a helping hand — and then perhaps the project grew and others liked the idea so much, that they too wanted to get involved. Or maybe a speaker has a talent that they would like to share. They could tell the audience about how they developed this talent — or the effect they see in others when they perform. If you can have a student in your class already, or know of a student that would fit well into some of the categories above, and would like to nominate himher then please fill out the this form. Tech Integration Post # 6 of 10: Skype an Author On The, Before-During-After, Writing Process. Skype is a service which allows the registered user to make free phone calls and video calls over the Internet. This is a free service but both users need to have Skype software downloaded on their computers before the technology will work. In order to make a phone call you’ll need a microphone to speak into and a pair of speakers to listen to the responses of the person you’re talking to. If you would like to engaging in video calls both parties will needed a webcam in order to be able to see each other. Using Skype in the classroom is not limited to author workshops, when using Skype you can bring a variety of professionals/experts into your classroom at their convenience. The following link takes you to a list of professionals/experts from around the world willing to Skype in your classroom. Example: Use an author to help teach your learner’s about the before, during, and after writing process. I’ve found that whenever you connect your learner’s to experts outside the classroom it enhances the validity of the task/assignment ten fold, and you’re students become more engaged. Let me know what you think. If you’re reading this and have used these techniques please feel free to comment or question. After watching the Olympics on CTV I was thoroughly impressed with their segments on athlete’s ‘Difference Makers.’ These segments delved into the lives of Canadian athletes to discover the people behind the scenes who drive them to success and help athletes reach their lofty goals. 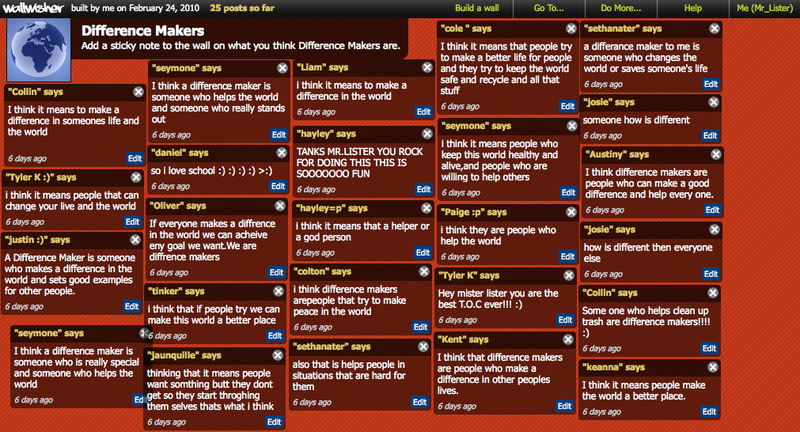 I mirrored CTV’s ‘Difference Makers’ but tailored it to my learners. I lead them to think about significant people in their lives who have help them become the wonderful people they are today. This post talks about just one of the stages in this lesson. Most of my learners hadn’t seen any of the ‘Difference Makers’ clips so I decided to write the statement ‘Difference Makers’ on the board and asked student to discuss its meaning in partners. Normally I ask my learners to write their thoughts, ideas, or comments to the topic on sheets of large paper. Often with mixed results. However on this occasion I thought I’d try www.wallwisher.com. I created a wallwisher page free of charge, named it difference makers, and created the conditions for students to post virtual sticky notes on a virtual classroom-board. During the time my learners were posting I observed 100% engagement in the activity. Had this been with pen and paper I doubt I would have experience the same kind of results. You could argue that perhaps they were all engaged because it was new to them. I guess only time will tell.